If you’re like most companies, you are mandated by OSHA to have a first aid kit in the workplace in case of injuries, which is how a first aid kit service company can really be helpful to you. It is the job of these companies to make sure that your first aid kits are regularly stocked and replenished with supplies. That way when emergency strikes, your employees have everything they need to help themselves or their fellow employees. And when OSHA inspectors come by, if you are in compliance, you will have everything in the kit that is required. No fines incurred! Are all first aid kit service companies alike? Not really. For Total Fire & Safety, we are well known for our commercial fire protection but we have also offered first aid services for the past 25 years! We know you have a choice when it comes to your first aid services provider and we encourage you to look at the following qualities before making a decision. Commitment. Some service companies will expect a lengthy contract from you even before service begins and they will charge a hefty fee to switch your service over from your current provider. Total Fire First Aid Services can get you started with no contract and there is no fee to switch from your current first aid provider. Product Quality. Have you ever applied a band-aid that doesn’t stick? Or taken an over-the-counter pain reliever that doesn’t work? Not all first aid supplies are alike. A competent, well-established first aid kit service company will sell you products that will unfailingly do the job when they are called into service. Experience. Believe it or not, there are many decisions to be made when it comes to purchasing first aid kits for your company. Depending on the number of employees you have, the type of facility you are covering and the likelihood of accidents, you may stock different supplies in your kits. There are different first aid kits too, ranging from general indoor use to those used for rugged, outdoor applications. 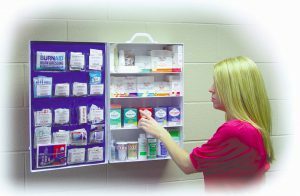 Your kits may be portable with a carrying handle or reside within a wall-mounted cabinet. Total Fire & Safety technicians are trained and qualified to recommend the best first aid kit supplies for your workplace and possess the experience, knowledge and commitment needed in any good first aid services provider. Summer is a great time to consider switching to Total Fire & Safety. If we can help you make the switch, contact us at 630.960.5060.